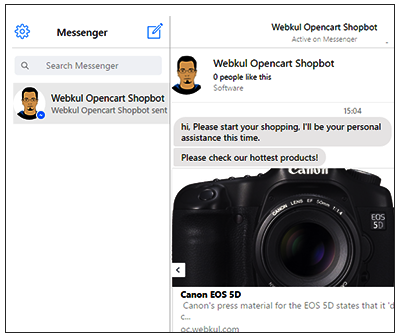 Opencart Facebook Shopbot : Now you can add facebook shopbot feature to your store which will provide a new shopping experience to your customers. As like artificial intelligence this technology gives complete information of the product to the customer. This will help customers to customers to find complete details of the product in an easy way. Customers can generate facebook chat over browser or messenger and see most popular product list. Customers can ask for the available options and check it variable like color, size, etc. Opencart Facebook Shopbot - Now you can add facebook shopbot feature to your store which will provide a new shopping experience to your customers. As like artificial intelligence this technology gives complete information of the product to the customer. This will help customers to customers to find complete details of the product in an easy way. 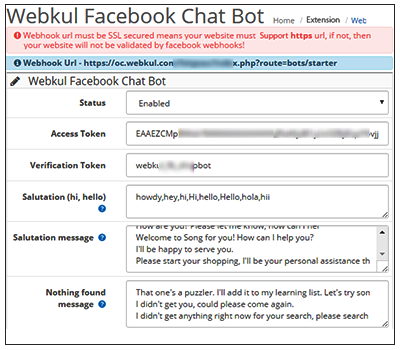 Customers can generate facebook chat over browser or messenger and see most popular product list. Customers can ask for the available options and check it variable like color, size, etc. Adds automated chat feature on the store. Customers can browse products on facebook messenger. Customers can ask query regarding products on facebook messenger. Customers can ask for product information on the messenger. Customers can check product options and their variable on chat. Customers can go to the product page from the messenger. Opencart Facebook Shopbot module provide the features to your store which will provide a new shopping experience and complete information of the product to your customers. This will help customers to find complete details of the product in an easy way. Customers can generate facebook chat over browser or messenger and see most popular product list. Buyers can browse products on facebook messenger. When customer login to their facebook messenger or facebook account to start the chat and will search your store page to start the chat. Once he sends the message then he will receive the reply from the shopbot. Customers can ask for any specific product from the store by typing the product name. Did you buy Opencart Facebook Shopbot?